Want to Add E-Signatures to Your Product or Service? More than 10 years ago, we started our company with partners in mind. We aimed to help software companies add e-signatures to their amazing products — from forms software to customer relationship management (CRM) systems. Today, that means we provide highly secure and customizable integrations for the top software companies in the country. Partner Focus — We carefully select our partners, and we are completely dedicated to our partners' success. We work hard to make sure our partners are happy. We continuously add features to meet specific partner needs. Superior Customization — Partnering with SIGNiX gives you complete control of design, email content, workflows and other behaviors. Integration can connect your documents to your other back-end systems to eliminate the need to re-key information. Practically every aspect of SIGNiX’s service is easy to configure. Outstanding User Experience — With our robust integration capabilities, you control the look and feel of the integrated e-signature product. When you customize the colors, fonts, buttons, logos and more, your users will have a seamless experience. 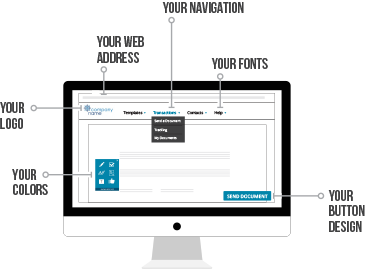 Through integration, documents can be presented in context to users that are currently in-person or logged into your system, eliminating the need to drop out of a user experience to wait for an incoming email message. SIGNiX demonstrated it has successfully worked with large partners in the past, such as zipLogix. Most importantly, they know how to properly stage a sale of this size. They brought the right people to the table at the right time. And the people of SIGNiX made a big difference. They are really strong. They showed us that there are good people behind this product. When embedding a third party into our system, it takes a lot of work to make it seamless. SIGNiX worked side-by-side with us to assure this happened. They were easy to work with, quick to respond and always forthright with the information we needed. They exceeded my expectations.